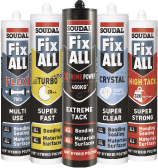 Soudal Fill & Fix Foam is a one-component, self-expanding, ready-to-use polyurethane foam with propellants which are completely harmless to the ozone layer. Every can comes with a straw adapter for quick, simple, and convenient application to fill gaps, cavities, and joints. With its high-yield formulation and an expansion value of 30 to 40x, each 750 ml can of Soudal Fill & Fix Foam can be expected to create up to 30 litres of cured foam. Soudal PU foams can be stored up to 18 months in unopened packaging in a cool, dry storage place with temperatures between 5 to 25C. Always store can with the valve pointed upwards. Always use safety goggles and gloves when using PU foam. PU foams are highly flammable. Do not smoke or have any source of fire near during application. For the full list of precautions, please consult the Technical Data Sheets and Material Safety Data Sheets as provided.